choose God | Phoenix From Ash, llc. I have, like many people, struggled with anxiety and depression for a good part of my life. It is where the enemy targets me—especially in moments where I am basking in the glory of God’s light. This time of year, November-January, is always the hardest. The days are dark and long. The stress is high. Each day is a battle, a spiritual one. My good friends got together. They did not invite me, I just happened to stumble upon them at a park where they were gathering. They greeted me with smiles and told me the plan. Of course, I was invited, they were glad I was there. But I knew I was an afterthought. A couple of them followed, but wallowing in self-pity, I didn’t return. Instead, I watched the gathering like an omniscient ghost. Every good friend I have ever had, met, or spent time with was there. Illogically they were together and having a great time without me, even though most of them didn’t know one another. Later, I flooded the bathroom–I’m not really sure how that fit into the dreamscape, but I woke up startled and confused, breathing in the anxiety of my dream. My friends. My Family. The people I do life with. I know they love me. Intellectually I have no problem accepting this. Yesterday I had an amazing time hanging out with some of the people who have been with me since elementary school–clearly not a place of anxiety This dream was stupid, yes, but it also is very telling about my fears. I had dinner with a friend of mine and I said something pretty stupid. My extemporaneous delivery in conversation sometimes is terrible, and my comment was meant as a joke, but based on her reaction I realized it was not life-giving, it damaged hope. I felt bad. I’ve obsessed over it for a few days now, even though I know she immediately either forgot or forgave my insensitivity, I still sometimes struggle with the feeling that one wrong move and all my relationships might just crumble. I fear many things, but rejection is pretty high on the list. Even when I’m with people I love and who I know love me, a part of my mind is always battling against the whisper that I am unwanted–that I don’t fit in and I should stop trying to. I fear being an afterthought. Forgotten. And worst of all, being isolated in my own head because I allow these fears to become realities. Because the fact is, sometimes I do allow it. When I said my foot is slipping, your love, O Lord, Supported me. When Anxiety was great within me, your consolation brought joy. The fact is simple. We all have a choice–to lean on God or let the world support us. The world will always let us down. No matter how much our friends and family care–they are only human and they make mistakes. We simply can’t count on them to sustain our life force the way that God alone can. Don’t get me wrong. Friends and family are important! Jesus had 12 BFFs that he did life with, but even Jesus asserted that we must leave them and trust only in God. Only then will we find consolation for our weary, fearful souls. I found this graphic to be simple, but effective. It helps me, so I’m sharing it in case your spiritual battles are equally mind-blowing. 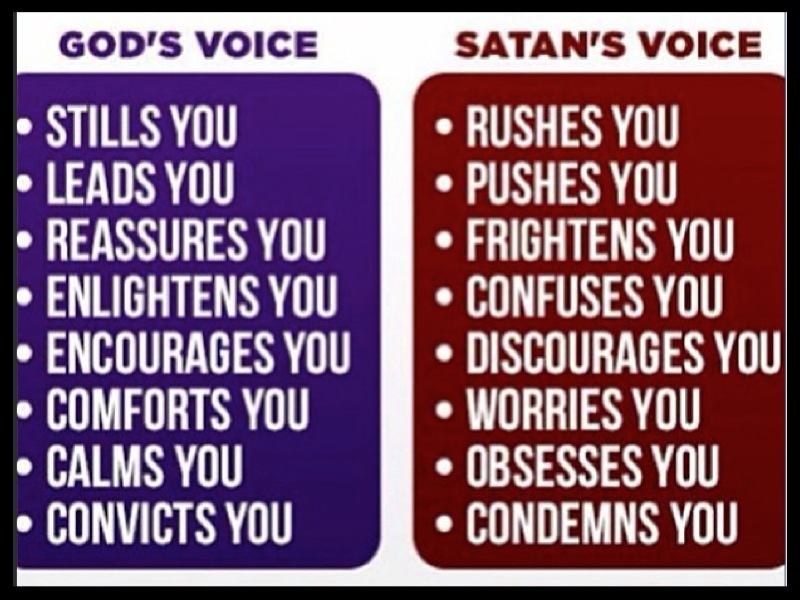 I can’t control every subconscious fear, but I can put God in control, and listen only to his voice. When he is my foothold, then the fears can never control me. Every day is battle of some kind and every day we must make a conscience choice about who is going to fight our battles. I have an independent streak that is a mile high and a country mile long. I hate, hate, hate asking people for help because my pride says that I should be able to do it all on my own. Most of the time when I am pulling inward saying, “No, I got this,” there are several people pushing from the outside and begging me to let them in and let them help. Because people rarely feel put out when you are genuine about needing help. They are actually begging to help because they love use. They love me and they want to do whatever they can to make my journey an easier one. So David, a great and mighty warrior, calls out to God for help and vengeance. It’s not a sign of weakness, but one of honor and humility. If people genuinely want to help us succeed, then how much more does God desire that we call out to him? I find a lot of hope in the idea of an equal opportunity God who listens to ALL who call to him–not just great an mighty warriors. Our world is so full of Inequality and hatred and scorn that pure, simple acceptance is a concept many of us cannot even fathom let alone accept. Categories are only useful when organization is meant to be efficient, but when it is used to degrade and inform people they are not worthy to be accepted or MUST be in a certain place because of certain pre-conceived ideas, that’s when we move into a flawed system. I have been privileged most of my life and as such have not experienced unadulterated hate, racism or discrimination as some people in this world have. That is not to say that my life is perfect, because I have experience my fair share of unkindness solely based on my family (or lack thereof), status, accent, or gender. And each of these incidents resulted in a deep soul wound, emotional scarring that over the years I’ve taken and laid at the fee t of the only person who is truly all accepting. But I fought against a lot of things to get to that point. Pride, hatred, self-doubt, etc. “Both high and low among me find refuge in the shadow of your wings” the Psalms declare and I rest there–healing as the Lord protects, guides, and fights for me. Preparing me for the world and whatever blessings or trials may come next because the Lord is good and his love truly endures forever.